Wouldn’t it be great to enjoy services from all three networks: Smart Prepaid, Talk ‘N Text and Sun Cellular? Now you can with Smart ‪TRINET 300‬! 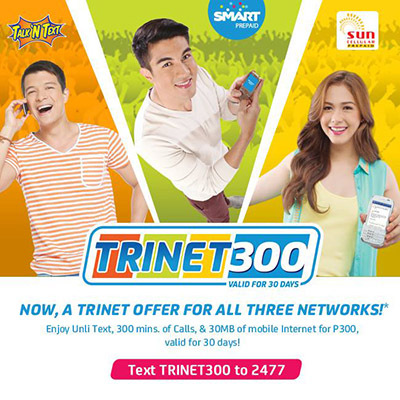 Just text TRINET300 to 2477 enjoy UNLI TEXT, 300 minutes of calls, 30 MB of mobile internet and more for 30 days! You can check out and try other SMART TRI-NET Promos. AFTER REGISTERING TRINET 300, HOW DO WE USE IT? ANY NUMBER WE NEED TO AFFIX TO THE CELL NO. E.G. CALL 100 WHERE YOU HAVE TO AFFIX *2827XXXXXXXXXXX OR DO WE JUST DIAL THE CELL NO.? eh pano naman pag di ako makapag register?nakaka 2 try na po ako eh..tama naman po ung ginagawa ko diba po TRINET300 then send sa 2477?? Since it has free 300 minutes of call, how do I check the number of remaining minutes? When I try to do a balance inquiry, I can only see the remaining amount and the expiration date of the promo. Please help me. Thanks! nakapa registered na po ako trinet 300, pero hndi naman po ako nakkapag internet ppaanu ba? hindi rin po ako nakakagamit ng mobile internet….candy chat po gamit kong cellphone cherry mobile pero android. mobile internet is not working, any response? How to check may call balance?